Ali Smith's books are imbued with a perceptiveness that is acute and probing for all that it is gentle and compassionate. She is a sparky and at times a wildly funny writer for whom the experience of being a gay woman is a central theme. Her writing takes its power from a subtly-paced accretion of small details that gradually reveal the fractals of meaning beneath the surface, the 'invisibles' of life. In this delicately incremental way she draws her readers towards sharing her insight and overview, creating a resonant sense of atmosphere and situation. In 1994 Ali Smith's first short story collection, 'Free Love', won the Saltire First Book Award. That she was a stylish and original new voice was confirmed with the publication of 'Like' (1997) and 'Other Stories and Other Stories' (1999). 'Hotel World' (2001) is an ambitious novel that takes as its scenario the intersecting lives of five women over 24 hours in the surreally ersatz Global Hotel, where fate, chance and death are on the register. 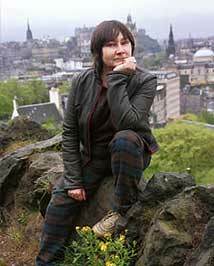 Ali Smith at Calton Hill, Edinburgh, 2001.